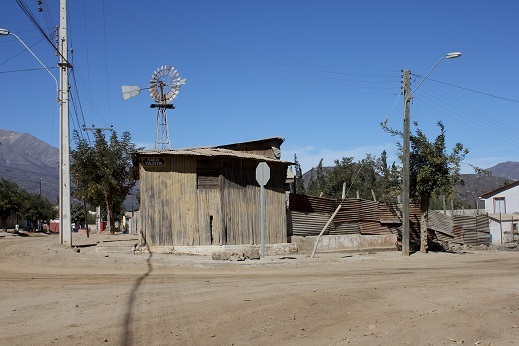 For more than 10 years the town of Los Caimanes in Northern Chile has sustained a struggle against the installation of a tailings-dam by Minera Los Pelambres, a subsidiary of Antofagasta Plc, serving nearby and expanding copper and gold mine. 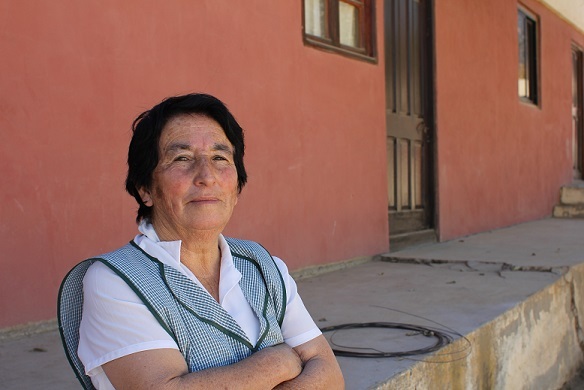 Resistance has brought residents into conflict with some of the widest-spanning economic interests in Chile: those of the oligarchic Luksic family. The case is part of a series of resource conflicts that have gained national attention. On June 12th activists from London Mining Network, War on Want and Chile 40 Years on Network participated as “dissident shareholders” in the AGM of Antofagasta Minerals Plc, a Chilean-British mining giant listed on the FTSE 100. The activists demonstrated their solidarity with the town of Los Caimanes in northern Chile. 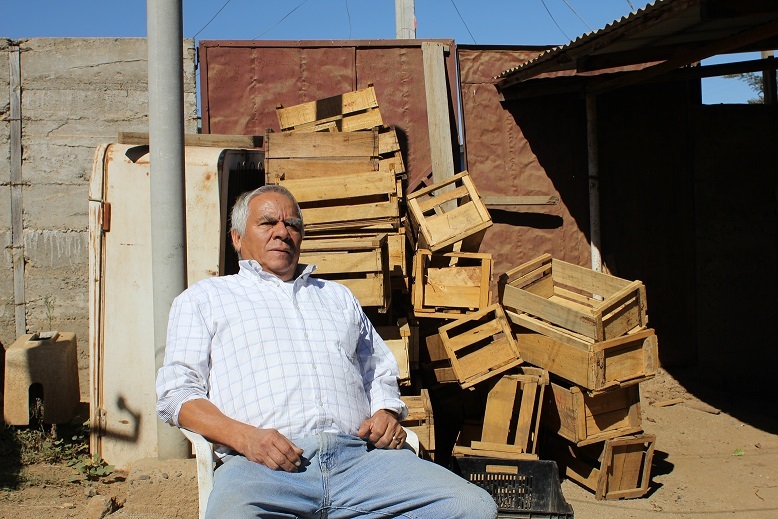 For more than 10 years, residents of Los Caimanes have sustained a struggle against the installation of a tailings-dam by Minera Los Pelambres, a subsidiary of Antofagasta Plc. The “El Mauro” tailings-dam serves a copper and gold mine near the border with Argentina scheduled for expansion. Los Caimanes’ resistance has brought them into conflict with some of the widest-spanning economic interests in Chile: those of the oligarchic Luksic family. The case is part of a series of resource conflicts that have gained national attention. The “El Mauro” tailings-dam is the biggest in Latin America, and third biggest in the world. It holds 2060 million tons of water and mining waste, and is over double the height of the London Eye. Severe risk of the dam collapsing in an earthquake, water pollution, its use of local water supplies, and the impact of mining on the local agriculture are the most central concerns about its installation. “El Mauro” is constructed on the same tectonic plate as the biggest earthquake ever recorded in 1960, which measured 9.5 Richter. If the dam collapses the community will have 5 – 10 minutes to escape. Because of its size it is likely to generate its own earthquakes, due to a phenomenon called induced seismicity. This occurs when a dam or reservoir reaches a certain size where it begins to generate its own tremors. Despite the latent risk and a recent Supreme Court ruling, no evacuation plans or early warning system exist. The company is still unwilling to pay for any of these. Pictured Right: Oswaldo, a community activist. To construct the dam underground water flows were diverted, leading to an 80% loss of water in the valley. This has been calamitous for local agriculture – miles and miles of land is now useless. To this day Minera Los Pelambres deny that the water supply is also contaminated, citing reports done by experts employed by the company on water quality. However an independent report conducted by Dr. Tchernitchein from the University of Chile shows high levels of toxic metals including molybdenum, mercury and nickel. His report outlines potential health effects such as stomach ulcers, lung cancer, memory loss and infertility among others. The community even won a case against Minera Los Pelambres in the Court of Appeals in 2006, over water quality. The case was a victory that led to a wider setback. To deflect the need for other action the company paid off $23 million to Victor Ugarte, a local landowner who left the valley soon after. Ugarte then distributed “donations” of $5 million to select neighborhood supporters. This was a pivotal and bitter point for the community; Maria Vilches, leader of the Committee for Drinking Water in the town explains “we’re still paying for what he did. He thought about the financial aspect and nothing else”. Los Caimanes has kept a strict organization to their planned actions. Two elected committees meet every few months with residents and take votes on courses of action. However despite resistance tactics including road blocks on the road leading to the tailings-dam, endless protests outside ministers’ offices and even an 81 day hunger strike by community members in 2008, the company has never deigned to negotiate an inch. 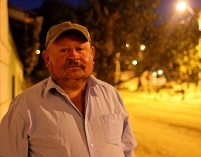 Minera Los Pelambres have used division and intimidation against the community constantly. Activists site police intimidation such as disproportionate semi-military policing of their protests and visits by police to activists’ houses in the middle of the night. 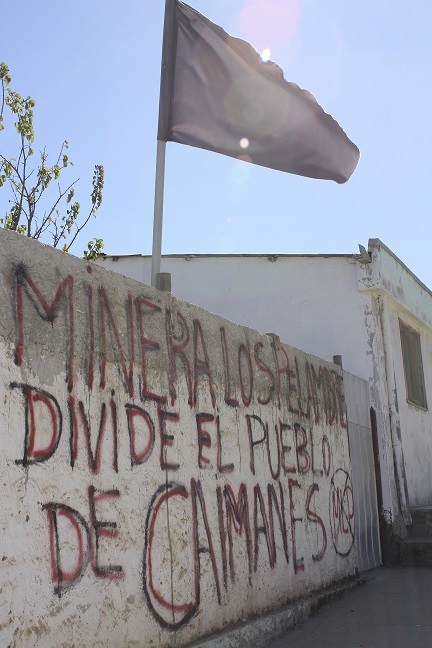 Last year Minera Los Pelambres rushed a legal case against the activists and the community’s lawyers through local courts, accusing them of “illicit association”. All community representatives were found not guilty, but the motive of the case is clear. 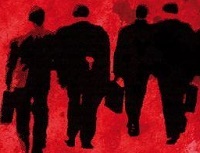 It was intended above all to demonstrate the colossal power and arrogance of the company. Community members were subject to attempted humiliation – such as the playing of activists’ phone calls in court – an illegal practice in Chile. Pictured Right: Juan, a member of the Committee for Drinking Water for Caimanes. Indeed the company’s actions attempt to assert their power over landscape and memory in the Pupio valley, where Los Caimanes is located. The dam retains the name of the large farming community it displaced. Prior to construction thousands of petroglyphs belonging to Diaguita and Molle pre-Columbian cultures were excavated in an act the Chilean Archeological Society has called “the greatest loss of heritage in recent [Chilean] history.” In the authorization of the excavations the company was legally bound to build a museum and publish their findings. However no museum exists, nor publications, and the pieces are stored in a plastic tent next to the site. 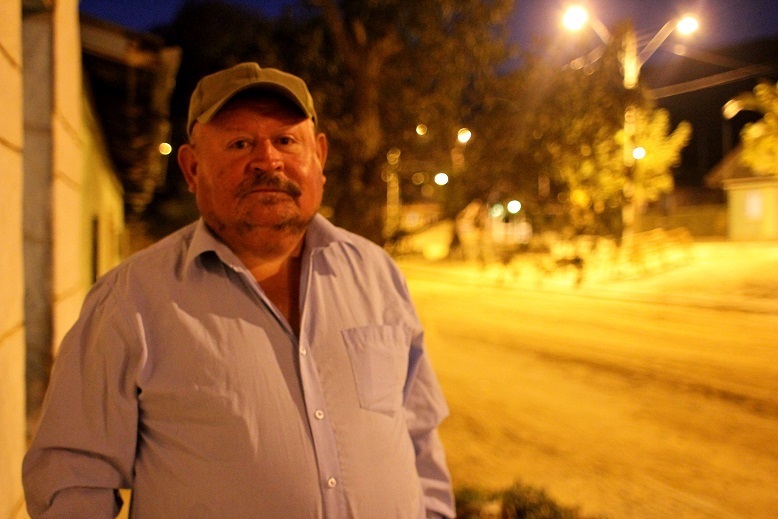 The leader of the Committee for Defence of Caimanes, Cristian Flores, is from El Mauro; “that is my land,” he says. “This ground is our history, and from our ancestors. That valley is so old that when they began doing investigations of the land they dug up preserved bodies. And all these pieces have been moved from where they were – they’ve lost their meaning.” The project is one of erasure; Minera Los Pelambres are blind to any identity of the land prior to its relation to their own capital. However individuals such as Cristian are fuelled by the destruction inflicted by Minera Los Pelambres. Patricio Bustamante, an archeoastronomer who lives in Santiago, has worked fervently for the community’s struggle since witnessing early excavations. Minera Los Pelambres would rather see Los Caimanes slowly dry up, its inhabitants live on a city’s periphery or without land, or blur them away through an malaise of legal cases. The Chilean state and families such as the Luksic are attempting to etch out more individuals from the countryside, robbed of the means of a self-sustained existence. They will then be absorbed into the labor market. A portion of the population of Los Caimanes has already been forced to migrate. Some were exhausted by the endless legal cases or demoralised by setbacks. The company often employs single members of families which makes resistance harder. Minera Los Pelambres also outsource the majority of their employment, alternating groups of workers brought from elsewhere in Chile every 10 days. This is common practice in Chile’s mining industries, where work is often precarious, of low pay and bad quality. The implications of this are a workforce that is contractually obliged not to involve themselves in community matters, and not willing to risk it an already precarious situation. They are the source of local unease as some see them as a strain on the few resources left. So a division has been manufactured by employment patterns that weaken resistance where two groups could work together constructively. Businesses run by the Luksics have long undertaken such tactics. By the end of the Pinochet era the clan had acquired one of the world’s largest fortunes, in particular making use of the new labour law brought in by the dictator. This enabled them to make huge layoffs of the workforce, picking off or bribing union leaders and manufacturing divisions between blue collar and white collar workers. All this is occurred against the backdrop of intense military repression. They expanded their mining empire during Pinochet years, and today have a presence in many sectors including hotels, finance and the media. Their power in media was visible in the absence of a censored television report on the “El Mauro” dam on Canal 13, which belongs to the family. They are notoriously corrupt; in the 1990s they were found to have paid $2 million to Vladimir Montesinos, head of security in the Fujimori dictatorship in Peru. This payoff concerned a factory they built on an ecological reserve in Lima. One of their banks, the Banco de Chile, was also discovered to be laundering millions of Pinochet’s silver.